Neem oil is a natural substance extracted from the seeds of the neem tree (Azadirachta indica), an evergreen native to India. 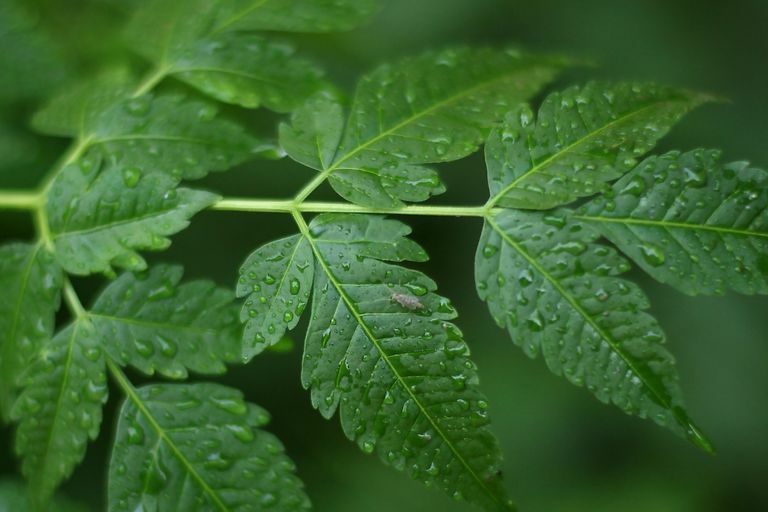 Long used in certain systems of traditional medicine (such as Ayurveda), neem oil is thought to offer a number of benefits when applied to the skin and/or hair. Neem oil contains several fatty acids thought to be beneficial to the skin, such as oleic acid and linoleic acid. In alternative medicine, neem oil is often used in the treatment of problems like dandruff and dry scalp. In these cases, neem oil is typically diluted in a carrier oil, massaged into the scalp, and left to sit for a period of time (usually 30 minutes or more) before rinsing. In addition, neem oil is used to treat nail fungus and acne. Neem oil is also said to soften the skin. Some proponents also suggest that neem oil can act as a natural insect repellent. Known as "azadirachtins," certain compounds found in neem oil are thought to possess insecticidal properties. Although research on the medicinal use of neem oil is fairly limited, there's some evidence that neem oil may act as an antimicrobial (a type of substance that kills or inhibits the growth of microorganisms, such as bacteria and fungi). A number of studies also show that shampoos containing neem oil may help treat head lice. In a 2011 study published in Parasitology Research, for example, scientists used a neem-based shampoo on 12 children with head lice. They found that a one-time, 10-minute treatment with the shampoo destroyed all head lice. Repeating the experiment with eight other children, the study's authors observed that a one-time, 20-minute treatment delivered similar results. What's more, several other studies suggest that that neem-based shampoo may get rid of head lice and their eggs without triggering any side effects. Additionally, preliminary research indicates that neem oil may help protect against insect bites. In a study published in the Southeast Asian Journal of Tropical Medicine and Public Health in 1995, for instance, scientists discovered that a blend of neem oil and coconut oil may act as a mosquito repellent. Since some individuals experience allergic reactions to neem oil, it's important to discontinue use of the oil if you experience symptoms such as itching or reddening of the skin. It should also be noted that neem oil has a strong, pungent smell similar to that of garlic or sulfur. In addition, neem oil should not be taken orally unless under the direction of a qualified herbalist or healthcare professional. There is not enough scientific data to provide a recommended dose of need oil. Different doses have been used in clinical trials. For example, in studies investigating insect bites, a cream containing neem oil 1 percent, 2 percent, or 5 percent has been used. Neem oil is sold online and many health food stores. Many sources recommend 100 percent pure, organic or cold pressed neem oil. Neem oil should be yellow-ish and have a small that is similar to garlic. Due to the lack of supporting research, it's too soon to recommend neem oil as a treatment for any condition. If you're considering using it, talk to your doctor to weigh the potential risks and benefits. Keep in mind that alternative medicine should not be used as a substitute for standard care. Self-treating a condition and avoiding or delaying standard care may have serious consequences. Abdel-Ghaffar F, Al-Quraishy S, Al-Rasheid KA, Mehlhorn H. "Efficacy of a Single Treatment of Head Lice With a Neem Seed Extract: an in Vivo and in Vitro Study on Nits and Motile Stages." Parasitol Res. 2011 Jun 11. Abdel-Ghaffar F, Semmler M. "Efficacy of Neem Seed Extract Shampoo on Head Lice of Naturally Infected Humans in Egypt. " Parasitol Res. 2007 Jan;100(2):329-32. Heukelbach J, Oliveira FA, Speare R. "A New Shampoo Based on Neem (Azadirachta Indica) Is Highly Effective Against Head Lice in Vitro. " Parasitol Res. 2006 Sep;99(4):353-6. Mehlhorn H, Abdel-Ghaffar F, Al-Rasheid KA, Schmidt J, Semmler M. "Ovicidal Effects of a Neem Seed Extract Preparation on Eggs of Body and Head Lice. " Parasitol Res. 2011 Apr 12. Sharma SK, Dua VK, Sharma VP. "Field Studies on the Mosquito Repellent Action of Neem Oil. " Southeast Asian J Trop Med Public Health. 1995 Mar;26(1):180-2.